This face mask was actually an impulse buy out of despair, when my acne was suddenly going absolutely wild back in November, and I was after a face mask to fix it pronto. I literally searched on Amazon , “acne face mask” and it was one of the first products that came up. After reading the reviews which were unusually highly positive, I decided to just go ahead and order it, and now having used it for a good couple months it’s been doing my skin wonders, so I though it was only right to share it with you! The mask arrives as powder that requires activation, so you have to make it up yourself. The instruction say either water or apple cider vinegar can be used , of course with me being fan of apple cider vinegar and it’s benefits for acne prone skin, that’s the option I went for! One thing I’ve definitely realised with this is that a little goes a long way. 3/4 of a spoonful with 1-2 lids full of apple cider vinegar , creates the desired paste texture for me, without becoming too watery, just the right thickness. 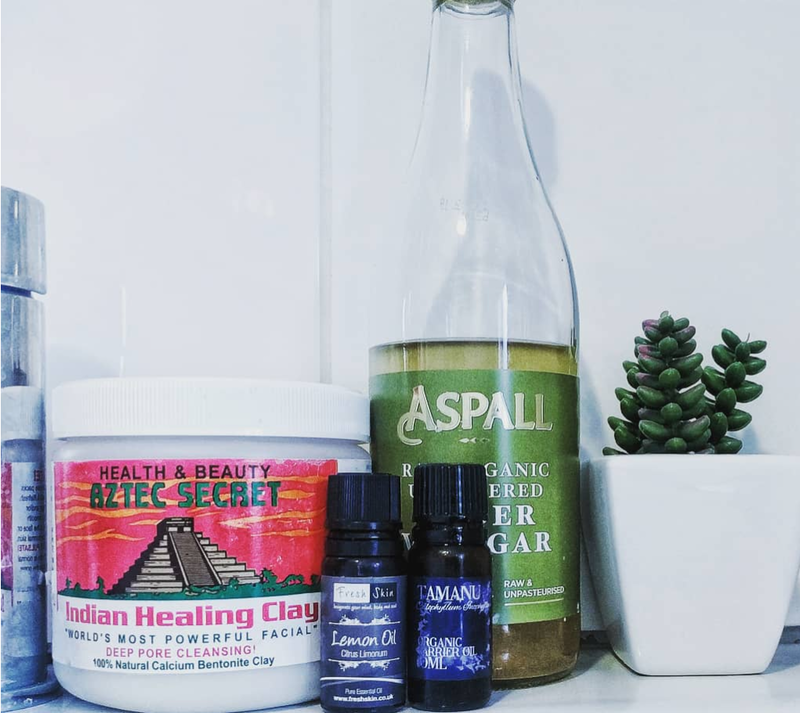 I also add a few drops of Tamanu oil (apparently good for acne prone skin), and lemon essential oil (good for pigmentation and skin brightening) which work an absolute treat for me. So it’s the perfect opportunity for you to personalise it to your needs and decide what additional benefits you want from the face mask by adding essential oils such as Lavender oil and Teatree oil etc. NOTE: When making up the paste, it’s really important to use a non-metal bowl and utensil as the metal objects can react with the clay and reduce it’s effectiveness. 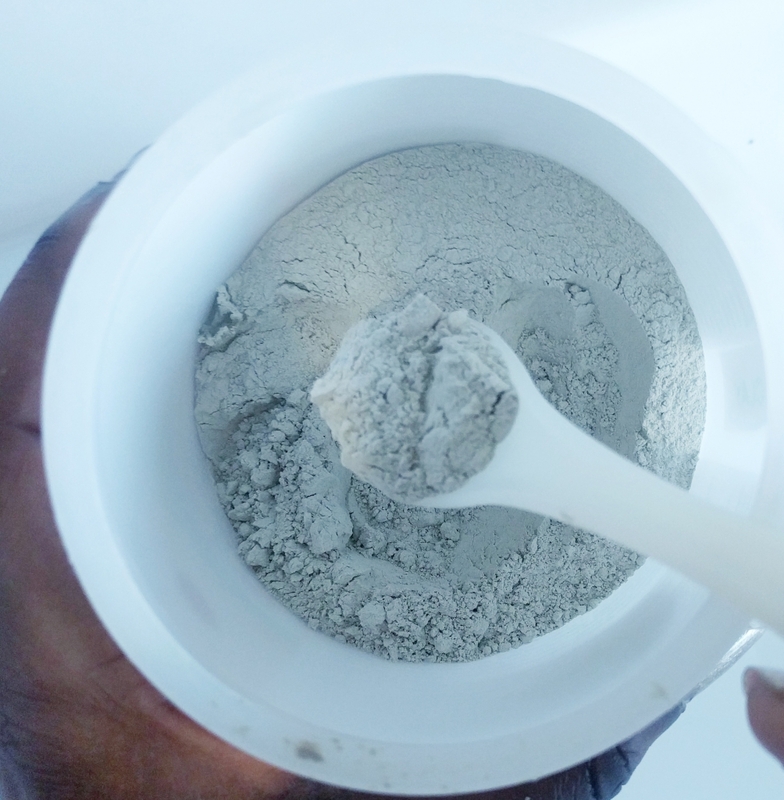 So the powder basically consists of pure calcium bentonite which is famous for having properties that include detoxifying and drawing out toxins from the skin, unclogging pores and reducing inflammation – and trust me you can feel it all happening! I leave it on my face till it completely dries out before washing it off! It does become quite dry, but if you keep adding water to your face it starts to soften up and washes off nice and easy. After use, my face always feels so squeaky clean and fresh, and it does a fantastic job at drying out and shrinking spots to reduce their visibility, and leaves my skin feeling nice a smooth. A good moisturiser, or serum, is essential after use as it can leave your skin feel rather dry, so it may not be the best for those with dry skin combination. Otherwise, I’d say its definitely worth a purchase, and if you have sensitive skin, maybe just use the water combination instead! But be sure to always patch test first! I tend to use it once or twice a week depending on what my skin’s like, and alongside my new skincare routine (blog post coming soon), it seems that I’m finally experiencing relatively consistent clear skin – Yayy! Anyways, have you tried this face mask before? If so let me know how you found it! Or is there a different face mask that you’d highly recommend? Let me know in the comments! Apple cider vinegar on spots?